Travel the most famous road in the world known as “The Mother Road”. The romance of Route 66 continues to captivate people around the world. Running between Chicago and Los Angeles. Over two thousand miles long this legendary old road passes through the heart of the United States. Depart the UK on your scheduled flight to Chicago. On arrival, transfer independently to your hotel for an overnight stay. After leaving Chicago, you drive south to the first iconic Route 66 stop, Springfield, the capital of the state of Illinois. Springfield’s favourite son was Abraham Lincoln and you’ll pay a visit to the Lincoln Home National Historic Site, which is the home that he lived in with his wife, Mary Todd Lincoln, from 1844 until 1861 when he became US president. Springfield is also the birthplace of the corndog and drive-thru restaurants, so make sure you arrive with an empty stomach. From Springfield, Illinois, it’s only a couple of hours driving to St Louis, Missouri. St Louis is one of the largest cities in the USA with a metropolitan population of over 2.8 million. Founded in 1764 it became a major port on the Mississippi River and even hosted the Olympic Games in 1904. The Gateway Arch commemorates the settlement of America’s West and it was from here that countless pioneers set out to conquer the wild frontier. Stop at Ted Drewes, an Iconic Route 66 attraction, and try a ‘Concrete’ – an uber-thick milkshake made from vanilla frozen custard. Perhaps you can spend the evening checking out the city’s vibrant nightlife. Home to Dolly Parton’s Dixie Stampede and their version of ‘The Strip’, Branson has become to country music what Las Vegas is to gambling. With over 50 dinner theatres, shows and other entertainment oddities, Branson is where it’s at in Missouri. It unleashes a hefty dose of pure Americana and a wonderful playlist to enjoy it to. Oklahoma, with more driveable miles of the old highway than any other state, is a mecca for fans of the Mother Road. Oklahoma City is the capital and the largest city in the state. You spend a couple of nights here and enjoy a full day to discover some of the city’s many cultural attractions. 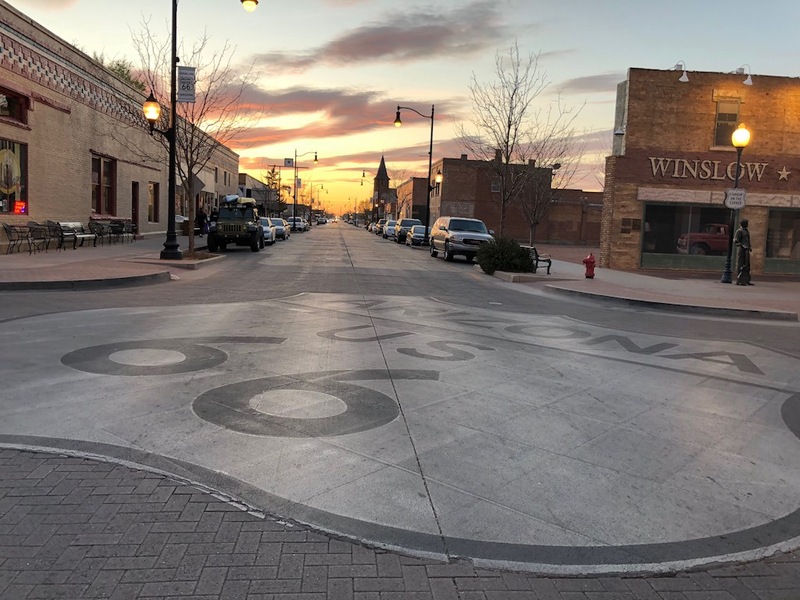 Visit the Route 66 Vintage Iron Motorcycle Museum and the Coleman Theatre – built in the late 1920’s, it defines an era of vaudeville and silent films. Oklahoma is also the gateway to cowboy country so what could be a better introduction to the ‘Wild West’ than an optional visit to the National Cowboy & Western Heritage Museum. Originally established in 1955 as the Cowboy hall of Fame and Museum, it has broadened its scope to encompass both Western and Native American artwork and artifacts as well as historic photographs. Amarillo in the state of Texas is your destination for today. On the ‘Way to Amarillo’ and before you leave Oklahoma, you’ll visit the ‘official’ Route 66 Museum, where you learn about the legends surrounding the road you’re travelling on and a short stop at Lucille’s Service Station & Roadhouse. Then it’s on to Amarillo where you make your way to the Big Texan Steak Ranch for a steak meal (optional). If you can eat a 72 oz steak in less than one hour, you get it for free! This is man vs food for real! Your Route 66 road trip continues with a visit to the Cadillac Ranch, where 10 classic cars are buried nose-down in the dirt. The owners encourage graffiti so grab spray can and leave your mark! Then it’s on to New Mexico and the city of Santa Fe. Although it is the state capital it is only the state’s fourth largest city and is known for its adobe architecture and new world spiritualism. The earliest settlements in the area were Pueblo Native villages that date back 1000 years, but the Spanish took over in 1598 and laid down the city’s foundations. It wasn’t till 1912 that the state of New Mexico became part of United States. The historic downtown area called the Plaza still retains reminders of the Hispanic era whilst the Palace of the Governors and the San Miguel Mission both date back to 1610 and are said to be the oldest European-era buildings in the United States. In the evening you may wish to visit Tomasita’s for hands down, the best hatch green chili before overnighting in an historic and unique property. From modern cultures to ancient civilizations you have the option to stop by the ‘Sky City’ ruins on the Acoma Native American Reservation. You spend the night in Gallup, New Mexico, home to a diverse population with a third of its residents being of Native American decent. Stay at the El Rancho Hotel, a little slice of history, counting John Wayne and Katherine Hepburn amongst its famous guests. So it’s not on the original Route 66, but it’s so close it would be a crime to pass it by! The Grand Canyon is an iconic symbol of the desert Southwest and a spectacle not to be missed. This incredible natural wonder is difficult to comprehend, even as you stand at the rim or hike down into the canyon. Carved over several millennia, this massive wonder of nature is 445 kilometres (277 miles) long, up to 29 kilometres (18 miles) wide and over 1.6 kilometres (1 mile) deep. Snaking through the canyon floor is the mighty Colorado River, which runs 2330 kilometres (1450 miles) through seven US states and two Mexican states. In your free time, we highly recommend a scenic flight over the canyon, which offers perspectives that you cannot see when exploring by foot. Also recommended is the film show at the IMAX Theater, which will give you a good overview of the area and how it developed. There are many walks that you can enjoy ranging from easy to moderate ones. There is also time to shop around for local souvenirs. The historic Route 66 town of Seligman and the Snow Cap Diner make for a quirky stop en route for a view of the Hoover Dam before you hit Vegas, renowned as the ‘tacky capital of the world’. If it is gambling you want, you have come to the right place as nowhere else in the world will you find so many casinos. In Las Vegas you’ll enjoy a city tour that takes us to some of the quirky things that epitomises this city, as well as learning about some of its colourful history. You also have time for some last-minute bargain shopping and have some time to relax by the pool before a night out on the town amidst the bright lights, casinos and world-class shows. On your final day you have the endless sunshine of California in your sights, following the Route 66 across the great Mojave Desert to the city of Los Angeles. You’ll toast farewell to an epic road trip and to your new friends from the iconic Santa Monica Pier. Depending on your departure flight time, there may be some time to enjoy some of Los Angeles many attractions before transferring independently to the airport for your return flight to the UK. We’ve driven Route 66 so can offer our personal advice and opinion about this iconic road trip in the USA. Call us on 0800 810 8404 to have a chat about Route 66, or send an online enquiry below.